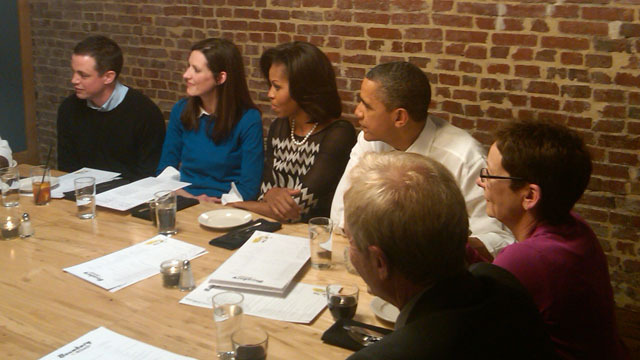 President Barack Obama and First Lady Michelle Obama dine in a DC restaurant Thursday evening with winners of an Obama campaign contest. Maybe it's not winning the Powerball lottery but dinner and some serious conversation with the leader of the free world does rank up there. Three lucky supporters and their guests dined with President Barack Obama and First Lady Michelle Obama at a small Washington DC restaurant Thursday night. It's all part of the campaign's effort to attract grassroots supporters' donations.The president has spent many evenings in the past months rubbing elbows with high dollar donors who pay as much as $35,000 for a chance to have dinner with him. But the concept of "Dinner with Barack" and tonight's "Dinner with Barack and Michelle" is for the president to be able to talk "with a few of the people who have taken ownership of this campaign," according to a Democratic campaign official. Tonight's winners included a non-profit executive from Nashville, Tennessee, ReGina Newkirk, a former social worker from Wauwatosa, Wisconsin, Cathleen Loringer, and a retired school administrator from Cambridge, Massachusetts, Judy Glassman. Each was allowed to bring one guest. This is the first contest featuring a dinner with both the president and first lady. There have been three other contests where the winners dine with the president solo. It's apparently been so popular and successful the campaign is currently running another contest soon. I think that with many more dinners like this President Obama will keep getting the pure, true message from 'we the American people' one on one, without the shadiness, the whitewashed, the edited points of view which is often given to him 'purged' through 3rd and 4th party messengers, like the Congress and the media polls! Read the whole thing before you spew John. These people WON a dinner with the President, simply because they are putting in time in their communities and states towards his relelection campaign! Yes...he's been to dinners where he 'rubbed elbows' with the rich 35K! So what? That's the kind of thing ALL Presidents have done! YES! That is an expensive plate, but everything cost more these days! And I know this, the people who bought the plates were the ones who WANTED to and COULD afford them! So what is it to you other than jealousy? Try to get yourself one of those 'free' dinners...see if you can WIN one too. I got an email inviting me to put my hat in the ring for the drawing! They were going to fly me there and everything. I just didn't throw my hat in! LOOK DEEP BEFORE YOU LEAP, JOHN!! Your biggotry and hate is still showing!!! You hate the President and anybody that is putting their money where there mouth is to support him!! And that's a whole lot of hate and envy! You and folks like this one Joey simply can't understand how in the world this man can still draw in so many wealthy, intelligent supporters anyway, after all you and the rest of your 'con' buddies have done to paint him into a bad light! Thank GOD for the intelligence we have left in this nation of fools!! You loathe anyone who stands up for him just through the blogs, while you pat the ones on the backs who denounce him like you do! You all are pathetic! Get ready for four more years! OBAMA/BIDEN 2012!! YES WE CAN AGAIN!! You seem to be the hateful one in this situation. You should be glad that a "regular" American citizen is provided the opportunity to speak for everyone regarding what is "REALLY" happening to communities, cities, and families such as your own. If you are truly concerned about the well being of your family, friends, community, etc., then the most logical and rational thing to do would be to retain President Obama for the next 4 years. My take on life today is that "as long as we are living" we will always have debt. Believe me the debt crisis will not be over within the next 4 years nor the next 20 years. The debt crisis in America and the World will end when GOD calls it to an end. It was ONLY extended By A Political Contribution, that is the game now. Your states are politically important to winning re-election, good press back home, just saying. This is pure PR. As if Obama really cares how his "guests" feel. They're just pawns that will be used in a big commercial. @Joey!! Shut up will ya?!? You all are nothing but a bunch of sour grapes and you have been ever since this man opened up his mouth and had the audacity to announce he was running for President of The United States! My goodness...you all are certainly pieces of work....good LORD!!!! I know, you hate anyone who doesn't share your views. If you had your way dissent against Obama would be a crime. WOW, I can't believe this is even being debated by the public. If people have the money to spend, why not spend it on what they want?? I doubt a few bought or WON dinners will bring in alot of voters. If he became President, he would set his base salary to $39,000, like the average Americans pay. And I doubt that he would charge for a few dinners with his followers. do you really think he is going to win? by getting some crumbs and not winning any states? I can't beleive all the hate we have in the Unitied States Of America in 2012. This President has showed us that he is a President for the people by being our voice for the common man and woman in DC. I got to give him credit for that, Thank you Mr. Obama, and i got you back in November 2012. As he said " I won we will do things my way" really listening to the people. NOT!! It's a free world dude. No one will miss you when you die of starvation lol. He would have to pay me to be in the same room with him. I am sorry, but you are an ignorant. Mark...You go ahead and put your Rethuglicans back in office and you 'rathers' will certainly become a reality! LOL!! Hate? Well maybe a little dislike and contempt, especially when it's personal and so obviously unfounded!! But not hate, because I don't know you!! I just know what you say and I see most of it as nothing but biggotry, selfishness, envy, and personal!! And just like all of you who daily wage words of ill-repuke against him...I will wage mine words for him!! Btw...this is a crime in most other countries!! It should be made a crime if you all plan on treating a US President like the way you have treated this one again! No other President has been treated this unfairly and with this much vitriol and this much disrespect in my lifetime!! Shameful!! You should be so lucky!! Hate? I could say the same thing about you! Fantastic post Liz. I agree with you all the way. No President has ever been treated this way – WOW – what a short memory you have – or is it selective memory and hearing when it comes to B.O. I guess you don't recall the insults that Bush received – "war monger" – compared to Hitler – moron – ignorant – dumb"....guess it only goes one way. I'm an independent but my god – how did this guy ever become President – what experience or record did he have – ZERO – if all the candidates had to submit their resumes for the Office of the Presidency -Barack would have never got by the first screening process. He was elected because he's a great Orator – best salesmen on the planet – all hat an no cattle – Keep drinking the cool – aid. I have volunteered my time and I donate regularly to the Obama campaign and would love to attend one of these dinners but I know the chances are slim to none of being chosen. I still can't believe that three years into his presidency that there are still throngs of haters in the country that think he's some kind of secret Muslim bent on destroying the country. Quite the contrary actually. Even with one hand tied behind his back he's prevented another great depression, improved health care, saved the auto industry in America and he's taken out the worlds most hated terrorist along with most of his buddies. I debate regularly with conservative friends and have found that they are all so locked into their conservative bubble that they can't even comprehend the facts that this president has done so much to get the country ion the right track again. I am 57 years old and I think that Barack Obama is by far the greatest president in my lifetime. he has not proved other wise. Wish I had read your whole comment first. Your crazy. He makes Carter look like a great president. He has added more national debt than the previous 43 presidents combined. The debt belongs to Bush and the Republican's. I guess you think he should have just taken office and done nothing while the country was headed down the drain. You need to get your facts straight. How typically pathetic of him. Prostituting himself out again like the used car salesman that he is. And nothing more. Sad. How typically pathetic of him.Prostituting himself out like the used car salesman that he is.Sad. wonder if this post will even get on, since there is much bias here-anyways i think its a great idea that our president and first lady dine with real american people! thats the majority who do the voting-the REAL american people, not lobyists, corps, politicians. many REAL americans have great ideals because WE have to live under the policies made for us. Its a BRILLIANT idea. Win dinner with the fool, not likely he does not want to here from those who do not agree with him. These winners where hand picked by his campaign. Great – another chance coming up. I hope I win. It would be so awesome. Unless you rely on government funding for your job or survival, you have no chance! I am a 70yr old grandmother living on social security and a small pension. i fear daily that i wont have enough money for basic necessaties , co-pays and extended medical care and medicines. but thats the facts of life and i know our president has been working hard to protect and improve these needs. however, our congress has blocked his every proposition. they have forgotten how to compromise and us. they appear to serve their own self interest. i am proud of our president and feel strongly that we need him 4 more years. stop hate! hate serves no purpose. ps i have never responded to political dialoge and have never emailed before but i urge our seniors to speak out. I think its a brilliant idea! too bad so many people are jealous and like to silence those who call them out. OH Please is this worth being on CNN. I would NOT have dinner with this President if he was the last man on thsi Planet. Why should I? Seriously? What can we possibly talk about? The weather? Get real. An executive for a non profit, a social worker, and a school administrator. Hmmmm All people who basically rely on government funding! Not often you have a "lottery" where the winners are "vetted" before anounced! If I had that much money to spare I would donate it to charity. I will pass on the hoopla but I would be honored to sit down at a family dinner with the Obamas.